The city has cut its emissions output by 11 percent since 2008. Chart shows usage across a number of sectors, including water and wastewater, buildings and facilities, street lights and traffic signals, and employee commute. 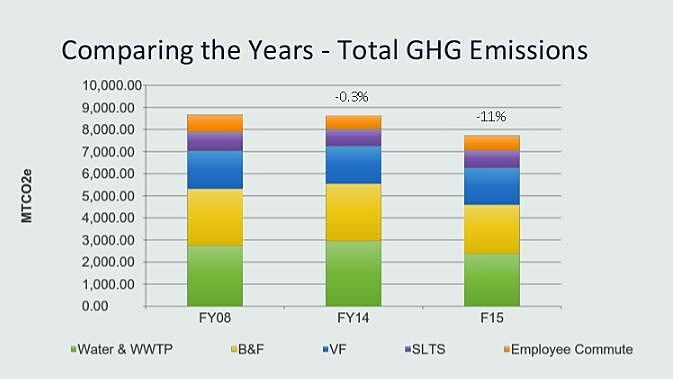 Despite modest growth in municipal government over the last six years, the city of Missoula achieved its goal of cutting greenhouse gas emissions 10 percent by 2015, much of it coming through a reduction in natural gas and a change in employee commuting habits. In fact, the city cut municipal emissions by 11 percent overall. Chase Jones, the city’s energy conservation coordinator, told the City Council’s Parks and Conservation Committee on Wednesday that by 2015, the city had shaved its carbon output 11 percent over figures included in a 2008 baseline inventory. The city’s Energy Conservation and Climate Action Plan set 2015 as the first benchmark on which to measure progress. The next benchmark arises in 2017, when the plan calls for a reduction of 30 percent. Carbon neutrality is sought by 2025. The latest figures found that by 2015, the city’s electricity consumption had increased 14 percent over 2008. Chris Essman, a member of Energy Corp America, attributed the increase to municipal growth. Since 2008, he said, the city saw a 25 percent increase in building square-footage, much of that due to the opening of the Park Place garage on Front Street. But where electricity usage increased, the city’s consumption of natural gas decrease 20 percent over 2008, despite a modest increase in days where heating and cooling was needed. The fleet of city-owned vehicles saw little change in greenhouse gas output. Jones said the vehicle fleet represented an area where progress could be made. 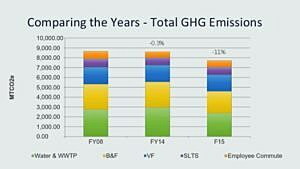 City employees also contributed to the municipality’s overall reduction in greenhouse gas emissions. Since 2008, employees marked a 14 percent reduction in carbon output, much of it attributed to sustainable transportation. Mountain Line’s zero fair initiative was launched in January of 2015, and more city employees are riding the bus to work, or finding alternative ways to commute, according to Essman. However, Essman added, the survey used to measure employees’ commuting habits saw a low response rate of just 30 percent. As the city looks to the next benchmark in 2017, he said, the study will dig deeper in employee commuting habits. The overall picture suggests efforts made by the city are paying off, Essman said. Members of the City Council took the report as good news and a sign of progress. Even so, they said that additional growth, including the opening of Fort Missoula Regional Park and city ownership of Mountain Water, will pose challenges as Missoula moves toward zero emissions. Jones agreed but said it wasn’t an insurmountable challenge.